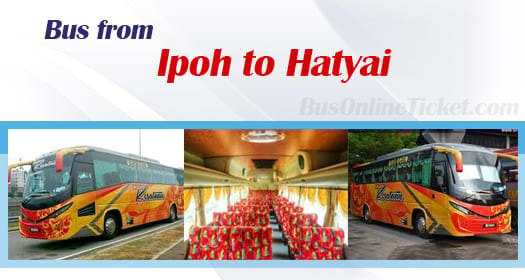 Bus from Ipoh to Hat Yai is one of the most affordable mode of transport to connect people between Malaysia Ipoh and Thailand Hat Yai. Many people prefer to take bus because it is a direct and fast transport service to travel from Ipoh to Hat Yai. For those who want to take flight or train from Ipoh, you have to transfer flight at Kuala Lumpur or transfer train at Padang Besar. That is because there is no direct flight and train service from Ipoh to Hat Yai. Therefore, bus becomes the most preferred and convenient option to travel between these two places. Kesatuan Express is the only bus service provider offering bus from Ipoh to Hat Yai. The bus schedules from Ipoh to Hat Yai are at 11:55am and 11:45pm. Please note that there is no bus service available during afternoon session. The duration required from Ipoh to Hat Yai is around 6 hours depending on the road traffic and the level of crowd in immigration custom. Kesatuan Express is operating this bus route with comfortable VIP coach. Spacious seat in VIP coach makes you feel that the 6-hour journey is actually not so long. One stopover break will be given at highway resting area because all the buses in Malaysia have no toilet facility. The bus fare from Ipoh to Hat Yai is reasonably prices at RM 55.00. The pick-up point is located at Aman Jaya Bus Terminal and the drop off point is located at Hat Yai town central. With convenient online booking service and various choices of bus operators and departure points, BusOnlineTicket.com has become one of the most popular online booking in Malaysia and Singapore throughout the years. Instant confirmation email will be sent to you once the payment is made successfully.